Melbourne Bike Share is a great alternative for short point-to-point trips. It enables you to zip across the city at your leisure. It is inexpensive, as long as you keep to short trips, and is available to locals and tourists, for occasional trips or on annual subscription. The Bike Share is a government funded scheme, designed to build a less congested and greener city. It is following in the footsteps of similar programs in Canada and Europe, where residents have been quick to take up such service. 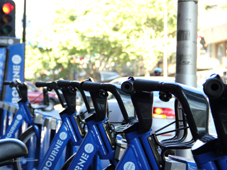 There are 50 bike stations around the CBD, Carlton and South Melbourne, with altogether 600 bikes that rotate around the stations. We have the handicap in Melbourne, that Victorian laws require anyone riding a bike to wear a helmet. This has contributed to the slow uptake of the Bike Sharing  there are not many of us who carry a bike helmet around. This problem is now being solved by making subsidized helmets available at 7-Eleven stores and some vending machines, for $5  with a $3 refund on return. DONT try riding without helmet! Victorian police are out there ready to hand out fines! 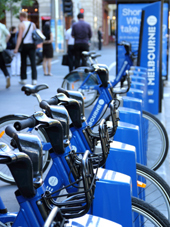 For a whole year of bike sharing, you need to buy your subscription online. With that you will get an access key. Personal subscription is $50, or $100 for corporate with a transferable key. 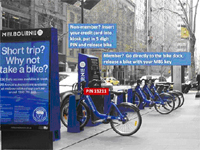 You can buy a daily ($2.50) or weekly ($8.00) pass directly at the pay station of each Bike Share dock, paying with VISA or MasterCard (and agreeing to a $300 security deposit). This will give you an access pin code. With this, you can make as many trips as you like within the purchased time frame. The Melbourne Bike Share is designed for short point-to-point trips. It does get expensive the longer you ride. If you need a bike for more than 2 hours, you are better off to go to a bike hire place. However, for many short trips  as long as you dock the bike in between - the scheme is perfect. In every trip, the first 30 minutes are free! For the next 30 minutes you pay $2, the next 30 minutes after that $5, and for every 30 minutes after that (over 90 minutes) $10  so watch your time! You need to buy your annual membership online. With that you will get an access key. Personal subscription is $50, or $100 for corporate with a transferable key. Some people have commented that these solid blue bikes look more like something from the dinosaur ages. They were specially built with a heavy-duty design, and are indeed very heavy. Nevertheless, they are relatively comfortable (although the saddle is rather hard) and with a 3-gear system able to handle pretty much any hill youd come across on your city trip. The saddle is easily adjusted to your height. The bike is a step-through comfort bike. It has a sturdy basket with Oki strap that can take up to 5kg, and mud and chain guards to keep you clean even in wet weather. The bikes have inbuilt front and back lights and that way are safe to ride 24/7. They are well serviced  you get a smooth leisurely ride. If something is wrong with a bike you simply return it to the dock, press a red button, and take a replacement. You will have to contend with traffic though  bike paths in the city are narrow, except on Swanston Street, which is closed to motor traffic. The bicycle paths along the Yarra and in the Docklands however, make great riding. Melbourne Bike Share is altogether a fantastic idea and a great way for your point-to-point city transport. Certainly beats the often crowded trams and is cheaper on short trips. It is also a more direct way of experiencing Melbourne for tourists and locals alike  as long as you sort out that helmet problem.